I'm having a lazy day. We moved my daughter and son-in-law into their brand new home yesterday. Second floor apartment to two story house. My legs are so sore, I can barely move. I did manage to make it to two estate sales that were little more than junk sales. I guess I can't expect to always find bargains. So today and the next few days, I am relaxing and trying not to think about all the boxes that my daughter needs to unpack. My home has a big empty spot in the living room. We moved "her piano" to her house. Her grandparent's gave it to her when she was five and I have been dusting it and listening to all of my budding musicians for eighteen years. I was a little sad to see it go but I am looking forward to hearing her play it in her "music room". She might be too busy to sit down at the piano for awhile. 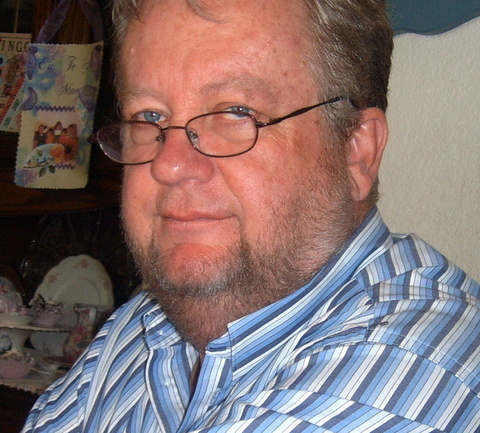 If you know this man...call him up and wish him a happy 55th birthday. He's officially a senior citizen at Dennys, McDonalds and best of all the thrift stores!! I thought I would share my latest estate sale and thrift store finds with you. 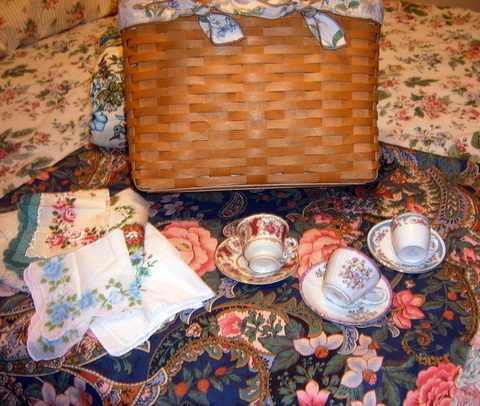 I was so excited to find a Longaberger basket at the thrift store for $2.95. I collect them and this was a really great find. It still has the botanical print liner and I laundered it and it came out as good as new. 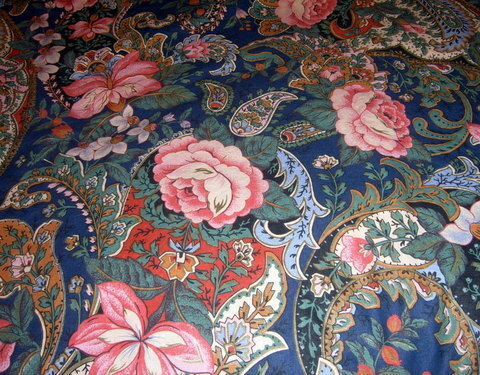 The beautiful paisley and roses fabric was also found at the same thrift store. I am thinking pillows or purses. There's at least three yards. 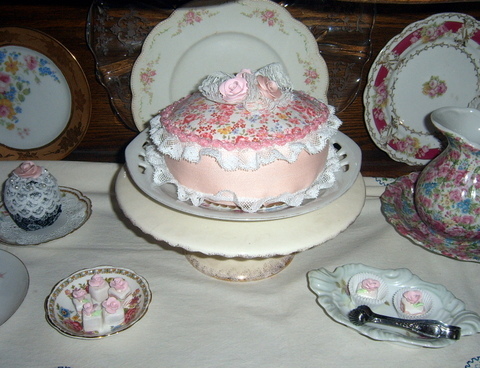 I also found these little tea cups and saucers along with all the pretty hankies at various estate sales. 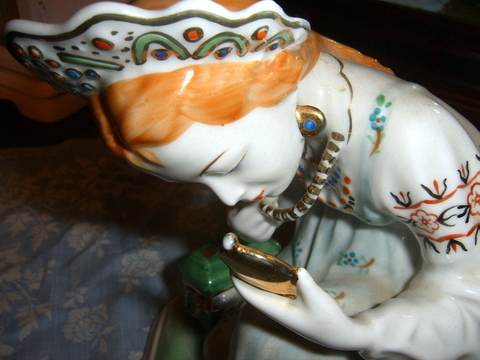 My favorite find is this beautiful figurine. She is marked with a small scale on the bottom. I don't know anything else about her except that she is lovely! I bought her on the second day of an estate sale for half price, only six dollars. 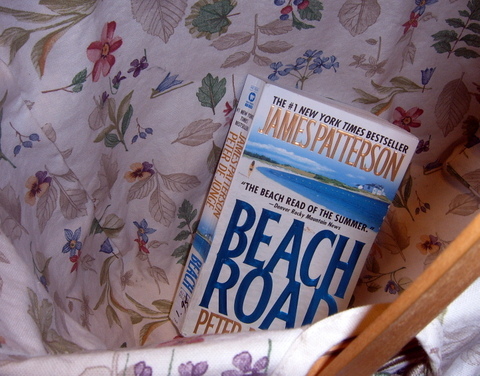 As for the book, Beach Road, I found that at the thrift store and it is one I have been wanting to read by James Patterson. I stayed up the previous two nights in a row reading until 2 a.m.. As soon as my husband left for work yesterday, I plunked down on my bed and finished it. I won't spoil it for anyone by telling you how it ends. It is a definite on the edge of your seat page turner. I hope Hollywood makes a movie of it and I really think George Clooney would be perfect for the main character. Oh, if only I could go around the country and visit all of you. I'd be vacationing for weeks. I do need a vacation and I will get a little one next month when we go to Pismo Beach. I'll get to finally visit Susan Branch's new store. Arroyo Grande, where her store is located is one of my all time favorite places. 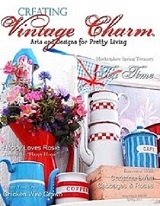 There's lots of wonderful antique stores to browse and quaint old houses to dream of living in. In the meantime, I'm working on my Etsy shop. I added this cake yesterday. 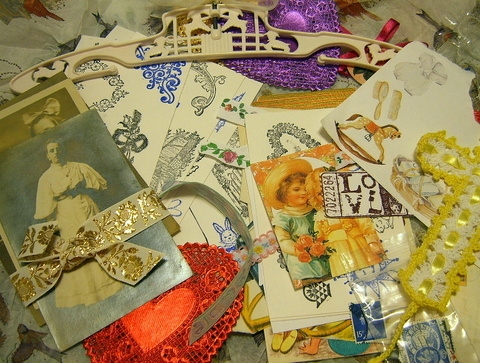 I've been working on bookmarks for Shabby in the City's bookmark swap. 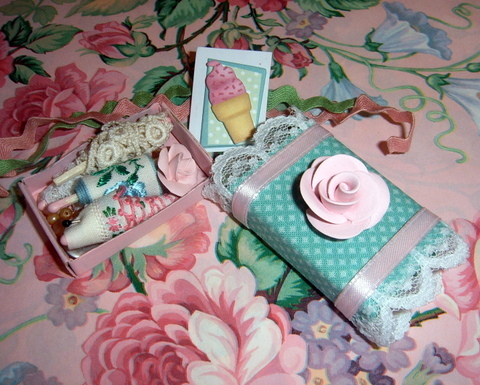 The last swap I did was a matchbox swap and it was so fun. 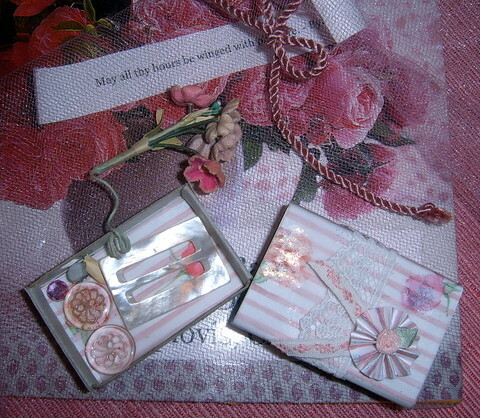 I made this one for Aletha in San Jose, California and she sent me a cute little match box of buttons and flowers. 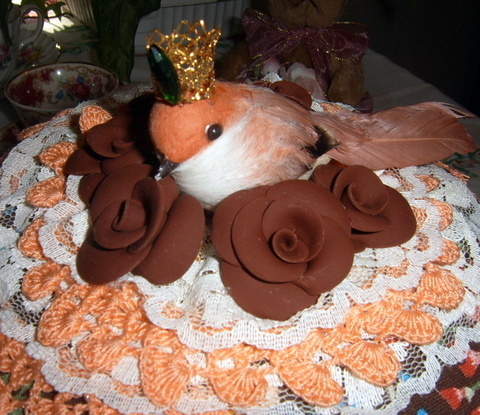 In my spare time, I added a crown to the birdy cake. She's a princess now. My sons think I'm weird. Someone, please...point me to the beach. It has been one of those days I wish I could save in a book somewhere and take it out and relive it every once in awhile. I can't even explain why it was such a good day. We didn't do anything special. I went to the store with my hubby. As we drove I talked about a video on YouTube that humbled me. 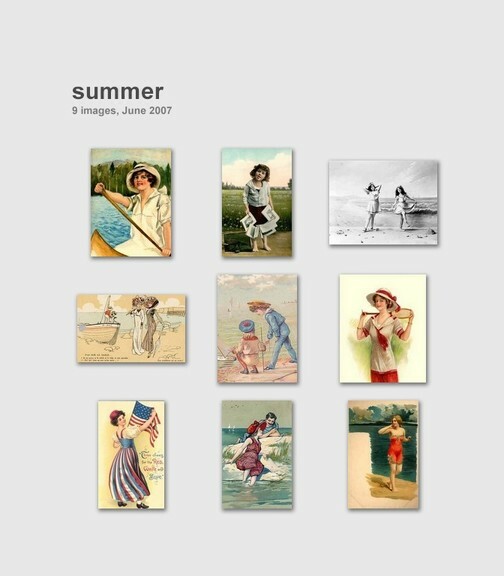 I found it on my new friend, Paula's blog. It was good to talk about it with my hubby. His dad was famous for waving his hands in Praise. My husband comes from a long line of evangelists. I was almost afraid to marry him because his brother is a preacher. His grandfather was a preacher and he studied to be a preacher. My faith, on the other hand, has always been very private. I've never been a hand waver. At times I have been a non-believer and sometimes my faith is so strong that I talk to Him all the time. I went through a period in my life where I strongly believed there was no God. My baby had died, my father died at age 61 and my ex-husband, who I thought would love me forever, left me for an internet princess. I would try to go to church and I would sit in back and cry and cry. It was at that time that I met my husband. Sometimes I think God had such a sense of humor sending me on a blind date with a Devout Christian. It's a wonder he ever asked me out the second time. His constant faith in God inspired me though and I now believe strongly in the power of prayer. We prayed together for my friend Amy as she battled with cancer. Many of her friends prayed for her here on the internet. She starts her chemo on Wednesday and I will continue to pray that she finds strength to deal with the treatments. Amy is an amazing woman. She has touched me and overwhelmed me by putting a link to my Etsy shop on her website today. I can not even begin to tell her and you how much this has meant to me. You see, I've never met Amy in person. I checked my Ebay stats and she has been one of my favorite sellers since 2005. We've shared emails and packages have flown back and forth between us. I now consider her one of my dearest friends. Tonight, Amy...I'm waving my hands high for you! Well, I'm back. I cleaned house. The house was clean. 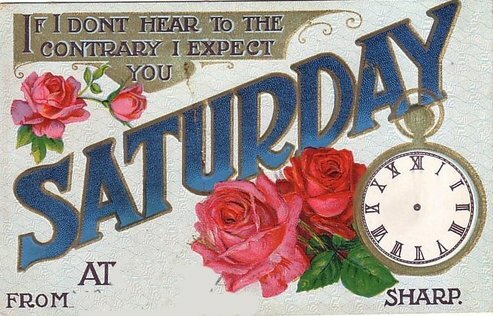 I say "was". I have two boys, actually young men, who live here. I seem to always have at least one extra male here too. Plus my mother. My house stays clean for maybe two minutes. Pillows seem to jump off the couch and land on the floor by themselves. There's always video games on the coffee table. Skateboards leaning up next to the front door. One day I will miss the detritus of boys. Maybe. It cooled down here. It is only going to be 99 today. Seriously. Last night was downright cool. We were supposed to go for a walk and never did. Shame on both of us. Actually shame on the hubby. I wanted to walk and he said, "Later". 10 p.m., he was ready to walk and I was ready for bed. Earlier in the evening, I worked in the yard. 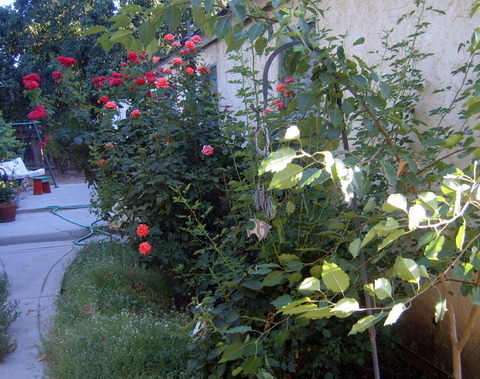 I actually trimmed the rose bushes in the top picture. They're trying to take over. 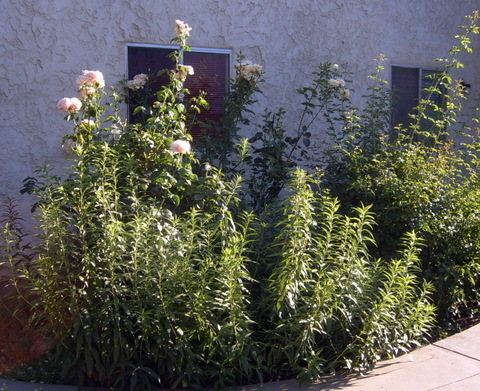 Why do I have such tall leggy rosebushes? 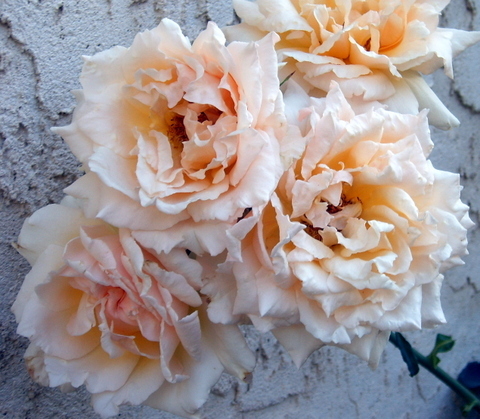 I would love to have compact bushes with lots of roses. Instead I have 6-7 foot tall bushes with roses I have to stretch on my toes to cut. The green stuff at the front of the border in this picture is another mystery plant. I mentioned before that I go to a "give and take" plant sale every year. I brought about four, two foot pieces of this plant home. It has multiplied many times and it has gorgeous sprays of bright yellow flowers every autumn. I have no idea what it is. It spreads like crazy and threatens to take over every year. Any one know what it is? I sound whiny, don't I? Did I mention it is only going to be 99 today? Here's a bouquet for you for letting me whine. Thanks friends! 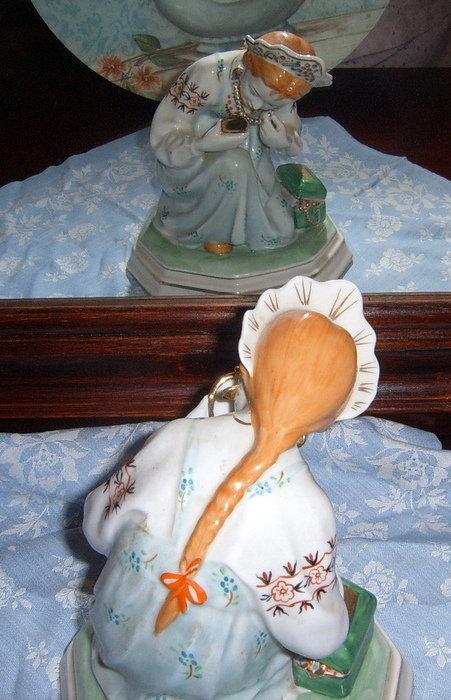 I went to an awesome rummage sale earlier this month and posted about the treasures I found. I mentioned that I needed a hanger for a cute little baby dress. Amy at Abundant Curiosities read my post and asked me if I would like the little pink hanger she had in her sewing room. Of course, I said "Yes!". 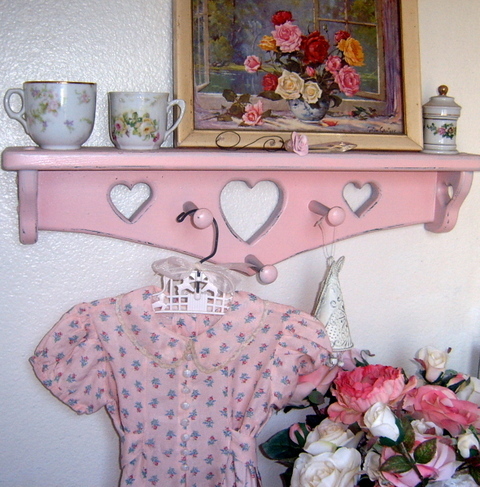 Not only did Amy send me the cute little hanger but she added lots and lots of scrap and art making supplies. Then, in the same mail, I received my order from my friend, Karen's Etsy shop. I saw MissesKwitty's red, white and blue inspiration pack and knew I had to buy it. 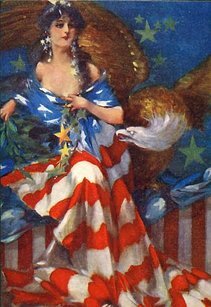 I already had this image of the woman I call Flag Lady. 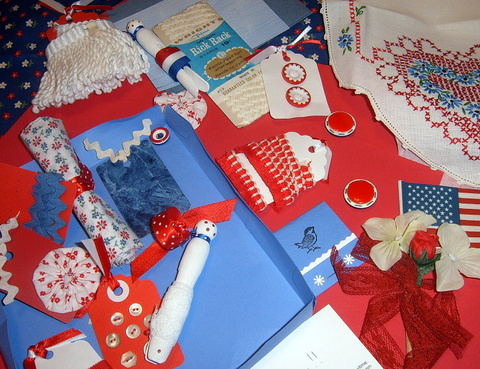 I'm going to use some of Amy's and Karen's bits and bobs to make a patriotic art collage or two. Before I get to play though, I am going to clean house. Now, I've said it here so I have to go do it now. So, I'll be back to read some blogs and talk about life after I get this house cleaned up. Wish me luck! I've been bitten by the craft blog. I just can't stop making things. When I'm not making things, I am thinking about making things. It's becoming a problem. I've been lectured by my husband. It seems that when he is home, I should spend some time paying attention to him. Imagine that! I did stop creating long enough to straighten the house, cook dinner, go shopping, play a game of cards and watch a rather strange movie with said husband. Seraphim Falls with Pierce Brosnan and Liam Neeson. Don't bother, unless you have a strong urge to hear cowboy drawls coming out of both of these non-American cowboys. Strange! Really, it did start out promising but by the end we were dumbfounded that we had spent our time watching Liam Neeson chase Pierce Brosnan across the mountains and desert. As for the cake above, it was an experiment. I made "chocolate" roses and I had those birds and some brown print material. 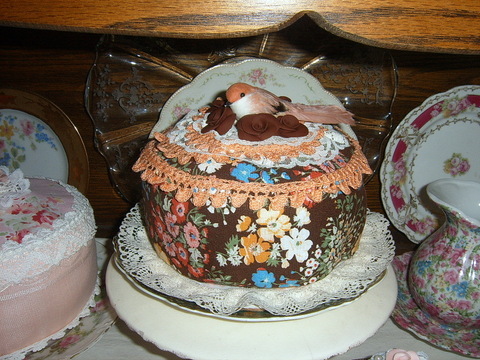 The little bird almost exactly matched the lace. 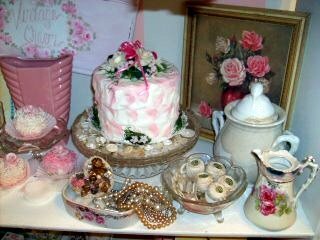 Some craft fairy whispered in my ear, " Make a cake". I'm not sure what I think of it. It seems like it needs something else. It doesn't match anything in my house. My youngest son wanted to know why I would put a bird on a cake. I don't know the answer to that either. In between everything else I did yesterday, I worked on a matchbox for Natasha Burns Matchbox Swap. I wish I could show you. It is so cute! 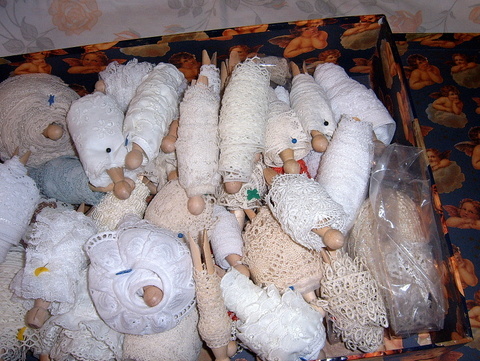 I also spent time sorting lace and winding it on clothespins. Who would have thought 40 pins weren't enough? Back to the store for me.